Last week as we were going through our normal social media marketing processes, and we began discussing one of the reasons our social media has been so successful in a very crowded space of social media tools. Many marketers, brands and individuals have multiple social media accounts, but often do not consciously integrate them to achieve the best results. The BundlePost brand executes a very specific procedure for leveraging all of our personal and brand social accounts to achieve the maximum reach, exposure, views and impressions. Some of you may be reading this a thinking to yourself, well duh, of course you have to cross promote and you’re right. However the difference between cross promoting across the social graph and having an effective process for doing so is what makes all the difference. 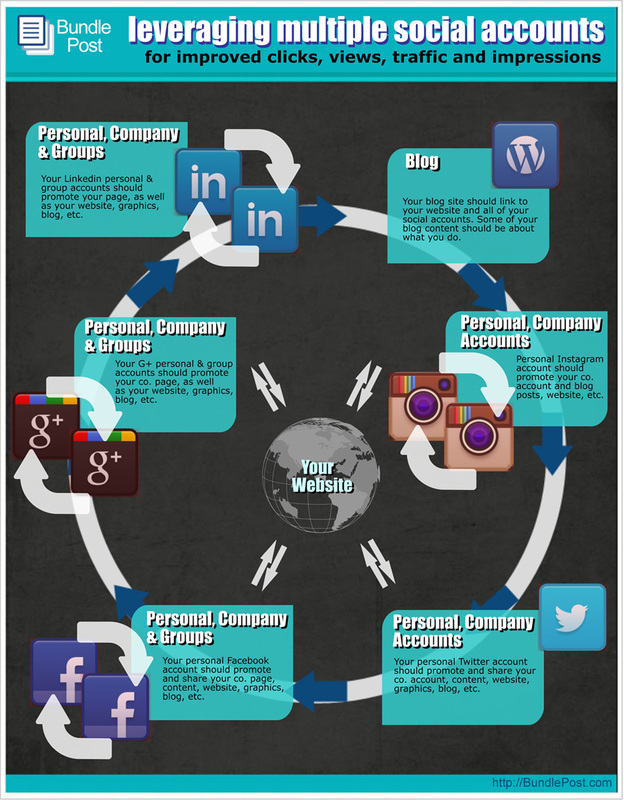 We have created an infographic that depicts a typical day of the BundlePost social media marketing process. Below in the infographic we will detail an example of our process using Instagram as well as an overview of what we do across all platforms. 1) Morning post of our created/branded graphic that consists of funny, coffee or social media related content. 2) All day we link back to that graphic on all other personal and business social accounts. 3) Our teams personal Instagram accounts post the same graphic to their Instagram accounts later that day/evening. 4) On days when a new blog post is live, the graphic for the blog is also shared late morning on the brand Instagram account with the URL for the blog home page. 5) Our teams personal Instagram accounts post the same blog graphic to their Instagram accounts later that day/evening. 6) At various other times of the day, the brand Instagram account posts other non-brand graphics. The overall intent of the process is to ensure maximum impressions over the course of the day. Regardless of which platform your target audience happens to be on at any given moment, your content will have the opportunity to be viewed. Just like with television, repeated impressions are what get the audience to take action or remember the brand message. 1) Consistency – The process needs to be executed daily, across all social accounts. 2) Selfless Value – You need to have enough curated, valuable, selfless content in your streams everyday, all day. 3) Repeat – You need to frequently infuse your legacy/evergreen blog, graphic and other content into your streams. You want to take a holistic view of your social media marketing efforts. An approach that incorporates all accounts that cross promote and drive traffic where you want it to go. The result of executing this process consistently is that you can stabilize and even predict the traffic to your content, blog and landing pages from day-to-day. You will remove the massive swings of new unique visitors to your website, blog and landing pages, without spending money on ads.